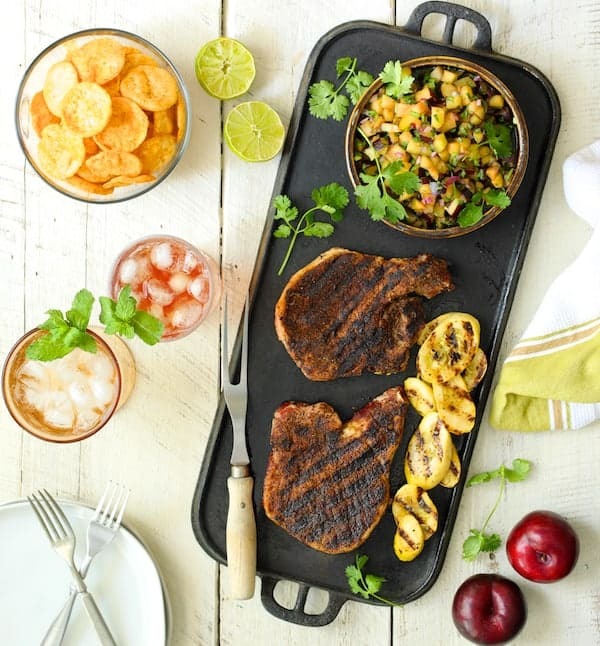 Southwestern Spiced Grilled Pork Chops with Plum Jalapeno Salsa is a delicious, summery dinner for two that’s perfect for date night or a weeknight dinner. It all comes together easily with the help of FarewayMeatMarket.com, Popchips and Southern Breeze Cold Brew Sweet Tea! Hey, all! I’m sharing something very special for an easy date night dinner for two that is super easy to pull together! I recently discovered FarewayMeatMarket.com. The legendary Fareway Meat Market, which has provided quality, Midwest-raised, cut-to-order meat service from expert butchers for over 80 years makes their pork and beef available to you online. ..And who isn’t totally into the convenience of online shopping? If you’re afraid to order meat online, you must give FarewayMeatMarket.com a try! I had never done it before but I was extremely happy with the quality. At FarewayMeatMarket.com, they pride themselves on quality, condition and accuracy. The meat you order from FarewayMeatMarket.com is shipped frozen to ensure proper food quality, safety and will exceed your expectations! All their meat is rich in flavor, hand-cut, fresh and tender with no additives. Perfect for summer grilling! The regular price of these items if purchased separately is $84.97. However, the Date Night Bundle is only $59.99! Because everything arrives frozen, you can always have perfectly portioned meats ready for everyday dining or a special romantic dinner on hand anytime! 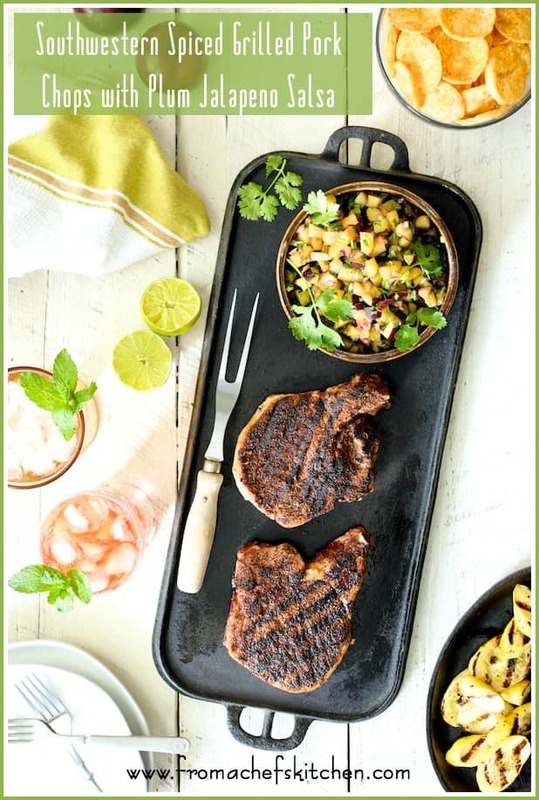 I used Fareway’s Iowa Pork Chops for this Southwestern Spiced Grilled Pork Chops with Plum Jalapeno Salsa. 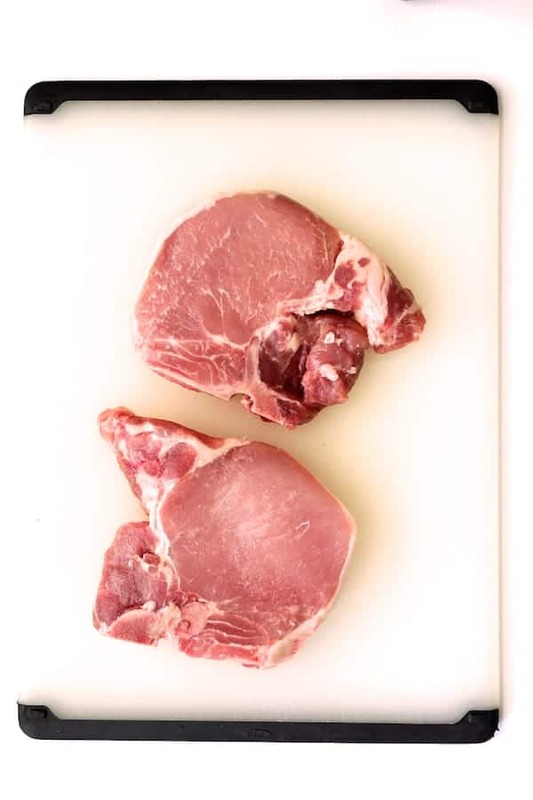 However, their America’s Cut Boneless Pork Chops would also be perfect. Looking for a fun, “weatherproof” snack to serve outdoors this summer? Give Popchips a try! Popchips are better-for-you snacks because they’re never fried and contain only real ingredients. 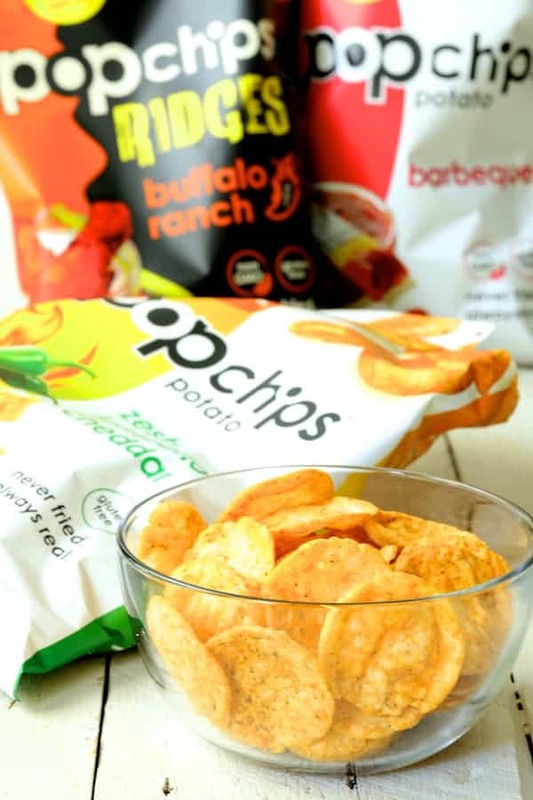 Popchips are healthy snacks and come in a wide variety of flavors such as Zesty Jalapeno Cheddar, Buffalo Ranch Ridges and Barbecue. New Zesty Jalapeno Cheddar is full of cheesy cheddar and pack heat with the punch of jalapeno. Buffalo Ranch Ridges has all the flavor of spicy, tangy buffalo sauce without the mess. A hit of cooling ranch comes to the rescue! Barbecue is tangy with a hint of smoke in every chip. Popchips are gluten-free so everyone can enjoy them! 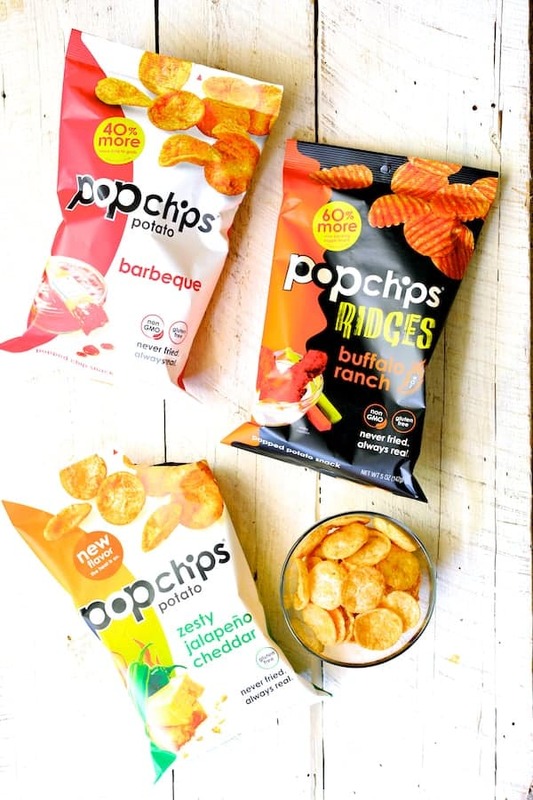 Check out all their flavors at popchips.com and order some today! Here’s the link to shop for Popchips online: Shop Popchips. With so many flavors, it’s tough to choose a favorite. 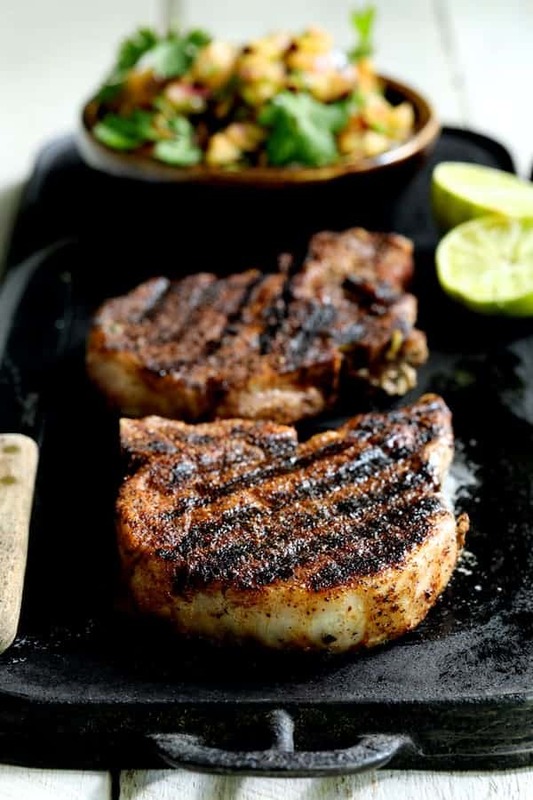 Zesty Jalapeno Cheddar pairs perfectly with these Southwestern Spiced Grilled Pork Chops with Plum Jalapeno Salsa so give it a try! For a cooling touch, serve with plain sour cream. I’m going to “come clean” right now. I’m not much of a tea drinker. I do, however, prefer iced tea to hot tea but having to boil water to brew the tea in order to end up with iced tea just always seems like too much work. Then you have to let it steep and chill. Boiling water when it’s so hot outside doesn’t sound very appealing either! After trying Southern Breeze Cold Brew Tea, I’m a convert! 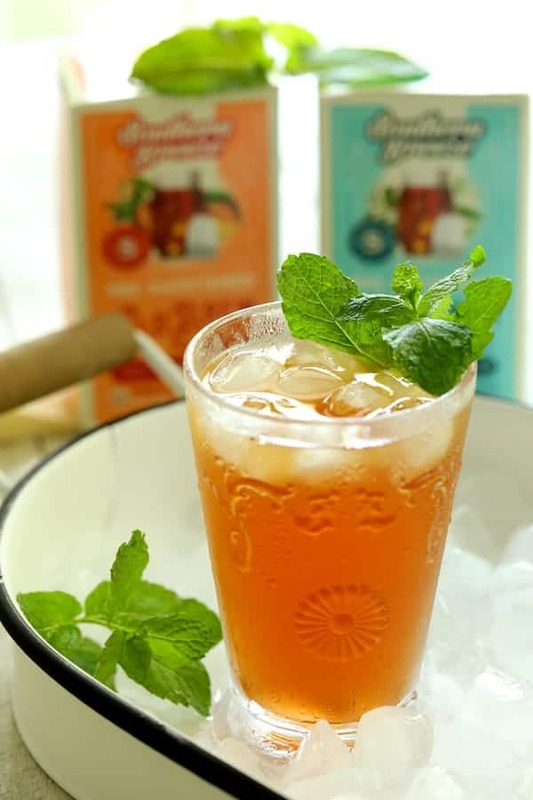 Established in 2014, Southern Breeze is an easier way to enjoy Southern-style sweet tea without all the sugar or guilt. Their specially blended tea is presweetened with zero calories! Individually wrapped, you can take them with you wherever you go! Best of all, a cold thirst-quenching glass of iced tea is ready in five minutes! 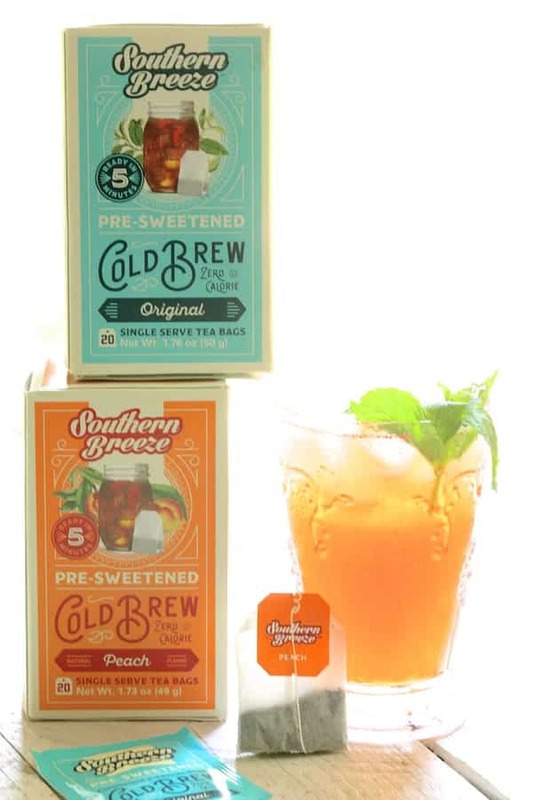 Find out more about Southern Breeze at Southern Breeze Sweet Tea and use code FREESHIPPING to get free shipping on your order of $30 or more. 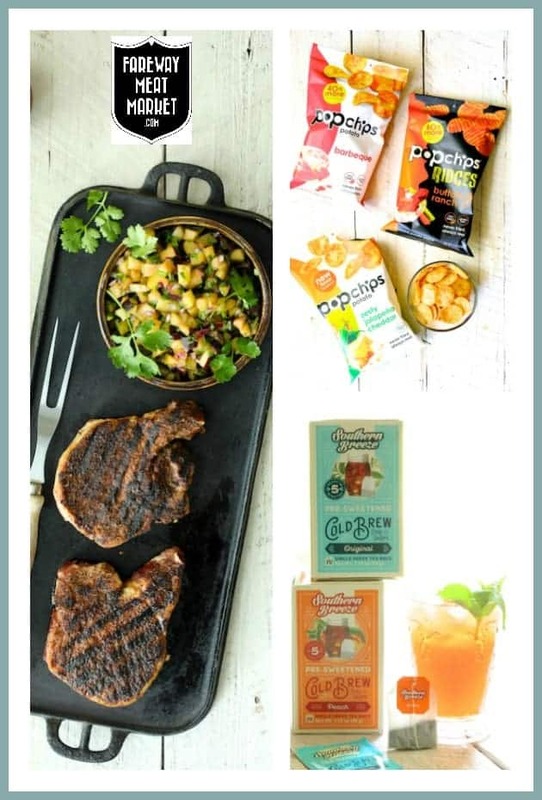 With FarewayMeatMarket.com, Popchips and Southern Breeze, you’ve got the makings for some fun, summer entertaining! Create a defined outdoor “dining room” with outdoor furniture you already have or borrow a few pieces from inside your home. Borrow from your yard and garden to create an unfussy centerpiece such as floating a large flower or even several in a glass bowl. Use flameless battery-powered candles on your table so you don’t have to worry about them being knocked over or the wind blowing them out. Repurpose white Christmas lights by hanging them around your party area to set a festive mood. Keep dinnerware casual. Use pretty disposables, melamine or even mismatched pieces from second-hand stores. Use a decorative tub or trough filled with plenty of ice to keep drinks cool. Keep the food seasonal and casual. Serve lots of salads, vegetables and fruit. Be aware of cross-contamination when grilling meats. Always use a clean platter for the finished product. Set plenty of citronella candles around the party area to keep bugs away. 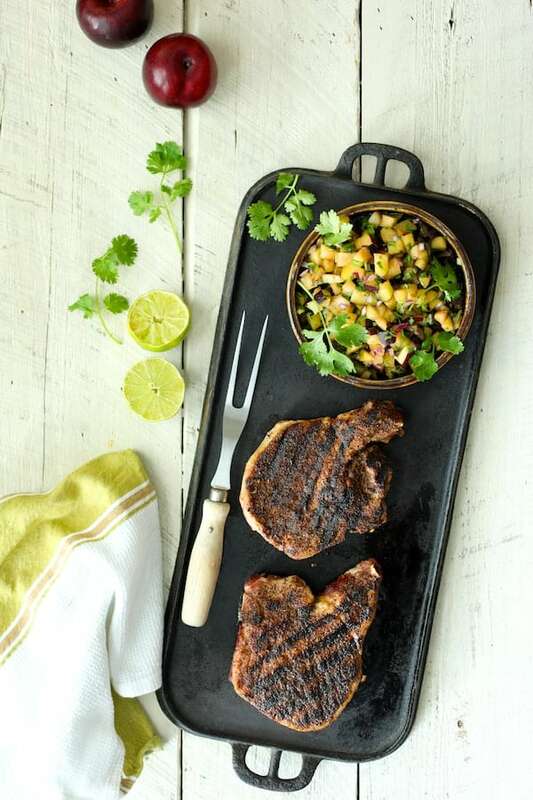 Okay, time to talk about these easy-peasy Southwestern Spiced Grilled Pork Chops with Plum Jalapeno Salsa! 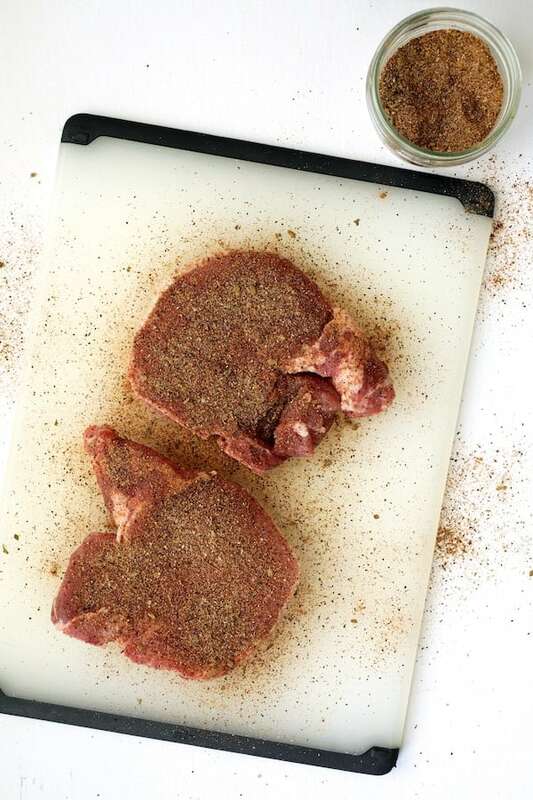 You’ve already got those thick, flavorful and juicy pork chops from FarewayMeatMarket.com so a simple spice rub is all they need! Combine all the spices in a small bowl then transfer to a jar and keep airtight. 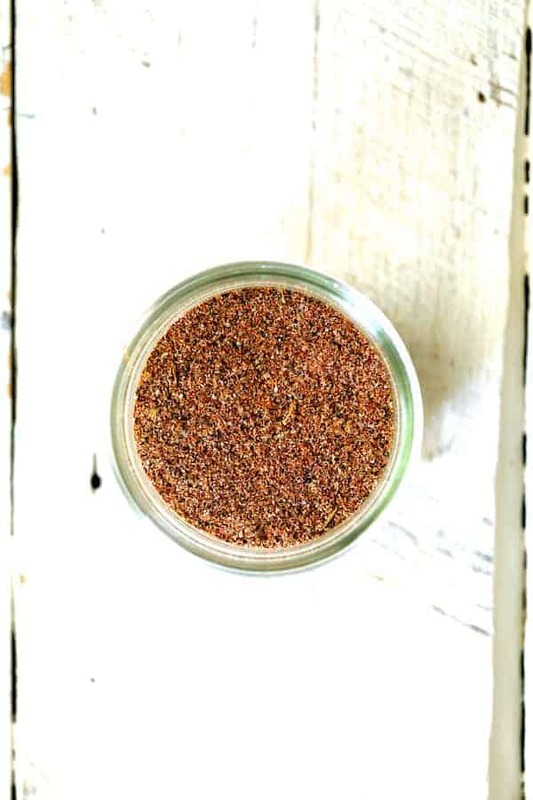 The rub recipe makes plenty so you can use it all summer long! Generously season the pork chops with the spice rub. Then grill. 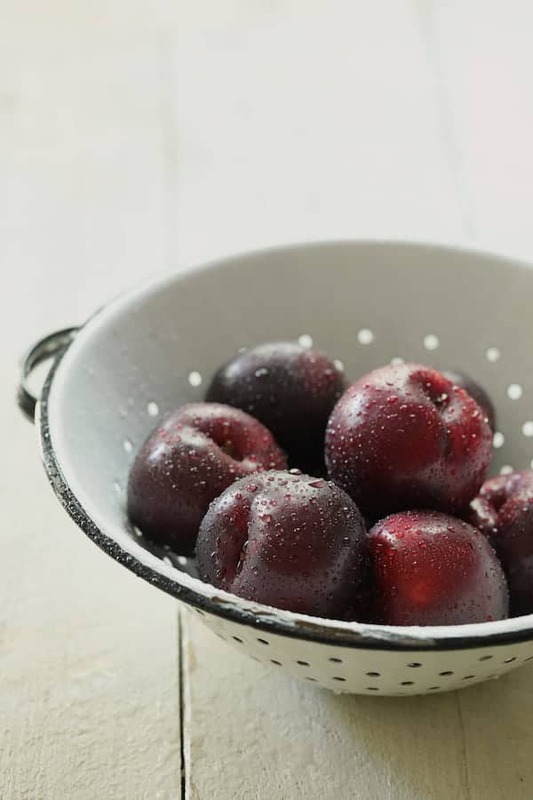 While the pork chops are grilling, prepare this fresh, spicy plum and jalapeno salsa. 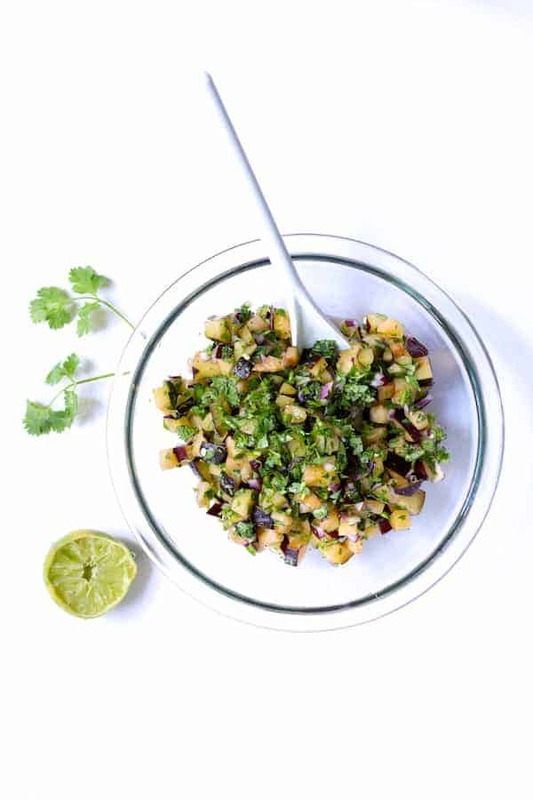 Combine all the salsa ingredients in a bowl then serve with the chops. Serve with some simply grilled vegetables on the side and you’ve got a wonderful, casual summertime dinner for two! 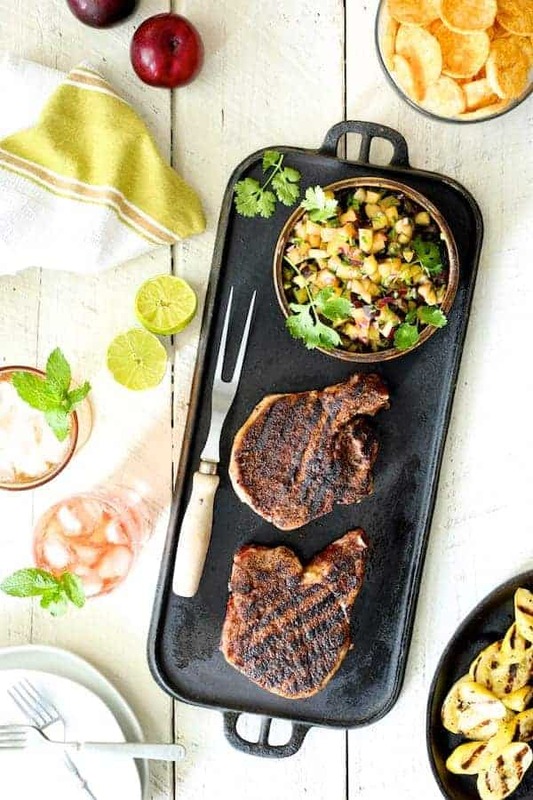 Southwestern-Spiced Grilled Pork Chops with Plum Jalapeno Salsa is a delicious, summery date night dinner for two that you can pull together easily!